For the past two years, the Disney-fied Star Wars franchise has given me back pieces of my childhood for Christmas. Star Wars: The Force Awakens brought me elation, while the standalone Rogue One: A Star Wars Story gave me wonder. Sure enough, this year a familiar-looking bearded dude came in the night bearing gifts as well, only he wasn’t jolly, cloaked in red nor carrying funny-sounding condiments. This one, Luke Skywalker, was cranky, resentful and, as played by Mark Hamill in Star Wars: The Last Jedi, utterly magnificent. The movie that director Rian Johnson (Looper) has built around Hamill’s performance is worthy of the boy who personified heroism for a generation, while it dares to question the legacy of its own universe’s mythology. This year I got a big stocking full of awe. 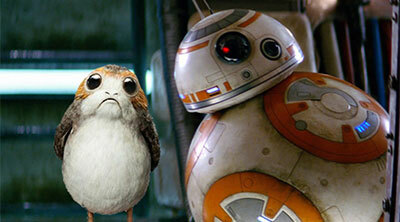 Also, porgs! I tread lightly here, for revealing too much of the plot would ruin the best twists. 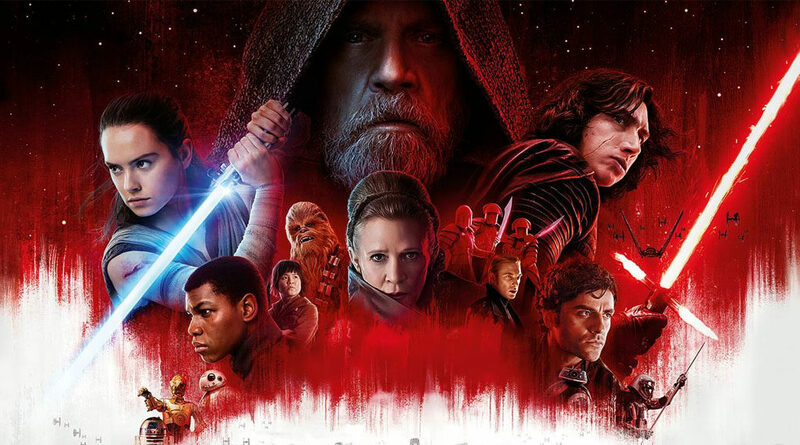 The movie strives to set itself apart from other Star Wars entries from its opening scenes, which surprisingly take place mere seconds after The Force Awakens. Having dismantled the First Order’s biggest gun last time, the fledgling Resistance led by Leia Organa (a pitch-perfect Carrie Fisher) is getting out of Dodge before the baddies led by Supreme Leader Snoke (Andy Serkis, the mo-cap Meryl Streep) catch up to them and blast them away with the rest of their smaller-but-still-very-effective guns. The conflict is kept unpredictable and at a constant fever pitch by trigger-happy hotheads on both sides – demoted Rebel maverick Poe Dameron (Oscar Isaac, in full Han Solo swagger) and parricidal Sith brat Kylo Ren (Adam Driver, channeling Joffrey and Neo). 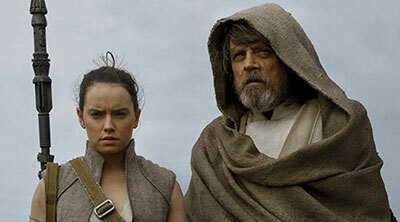 Meanwhile, hero-on-a-journey du jour Rey (Daisy Ridley, her plucky charm at maximum here) catches up to the recluse elder Skywalker (the OG Joseph Campbell H.O.A.J.) in order to bring him along for one last rodeo and maybe get some destiny training in the process. 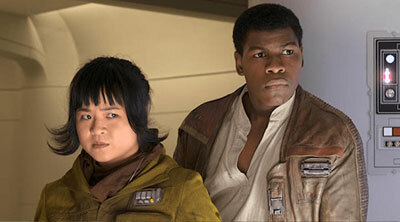 As for reformed Stormtrooper Finn (John Boyega, in full Han Solo pragmatism), he’s teamed with newcomer mechanic Rose (Kelly Marie Tran) on a side quest of sorts to find a specialist that may give the Resistance a fighting chance. Who they end up with is a stuttering Benicio del Toro playing Captain Jack Sparrow by way of Cantinflas. Trust me, it’s a lot better than it sounds. To say that nothing goes according to plan for anyone involved is both an understatement and a credit to Rian Johnson’s storytelling style. The chapter he’s charged to tell is a sprawling one that, albeit too long, never feels boring or by-the-numbers. He, like J.J. Abrams before him (who’s producing this time around), is clearly reverential to Star Wars. His efforts go beyond fan service or personal gratification, though, to something more Shakespearean both in grandiosity and levity. You get the feeling Johnson saw the original movies multiple times, owned all the toys, read all the novels, played all the video games and debated every hypothetical what-if with his like-minded peers. All the new creatures here are a welcome addition. Chief among these are porgs, the franchise’s answer to Scrat from Ice Age. The scenes where Rian Johnson and his production design team go full crimson are all masterful, especially the Throne Room brawl that is part Kill Bill, part The Cook, the Thief, His Wife & Her Lover. I cannot overstate how good Mark Hamill is here. His Old Man Luke routine is as compelling as Hugh Jackman’s aging Wolverine in Logan. Would Laura Dern choose a minor role just to be in a Star Wars flick? Didn’t think so! Domhnall Gleeson is such a wonderful actor. I suspect he relishes his frothing-at-the-mouth role of General Hux as a paid vacation. Kudos to Adam Driver for sprinkling some humanity to Ben Solo/Kylo Ren, the conflicted baddie everyone loves to hate. Granted, Chewie should still shoot him right between the eyes. I’m happy that this time we got to see Gwendoline Christie (Game of Thrones) behind the chromed Stormtrooper visage of her Captain Phasma, even if just a bit. It’s nice to see Arrakis-type desert planes don’t hold a monopoly on orphan would-be heroes. John Williams, you are in top form as always. Please live forever and continue to score my dreams. BB-8 still remains on my list of must-have Christmas toys. For pioneering and sentimental reasons, The Empire Strikes Back will most likely remain the saga’s gold standard, but even that masterpiece divided film-goers in its heyday. Empire received mixed reviews upon release and for a while in the early 80’s Return of the Jedi was considered the superior sequel. 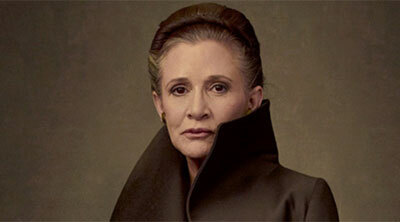 So it doesn’t surprise me that Star Wars: The Last Jedi also has a few detractors and alleged childhood-assassination accusers. Still, I predict its legacy will come into better focus with the passing of time. Like Empire, Star Wars: The Last Jedi dares to play with expectations while taking itself as seriously and as lightheartedly as it should. J.J. Abrams polished the Star Wars universe anew with The Force Awakens. Rian Johnson’s Star Wars: The Last Jedi pulls a Kobayashi Maru on it, to outstanding results. Movie description: A worthy entry to the 'Star Wars' canon that dares to break new ground and play with our expectations, all while balancing drama and levity.